So I built a solar box oven out of thrift store parts and was surprised how well it works. Potatoes, eggs, ribs, beans, roasted chicken, rice, and much more. It works well for cooking and requires minor aiming about every hour or so. For frying and boiling quicker I broke down and bought a parabolic dish. The 'Solar Burner' works great and is very fast cooking. A little bulky to move around, but if you have clear view of the southern sky cooking is a breeze. I use cheap enamel coated pots from the thrift store, but you can use most any vessel except glassware. I'm very impressed and pleased with its performance so far. Can't wait to try it in winter. 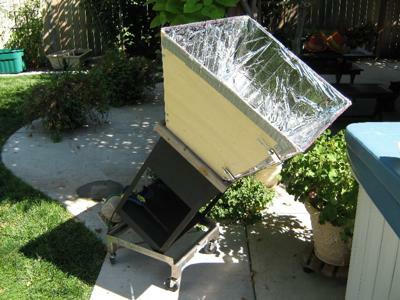 That is a very nice looking homemade solar oven, and it sounds like it is quite efficient and effective at cooking most any food. I do agree with you also that it is nice to have a parabolic solar cooker in order to fry, boil and cook up some things a bit quicker than an oven or panel cooker. I use all of my cookers in conjunction for maximum cooking efficiency of all of our meals. Thank you for the kind words about the "Solar Burner" we really enjoy this cooker too.